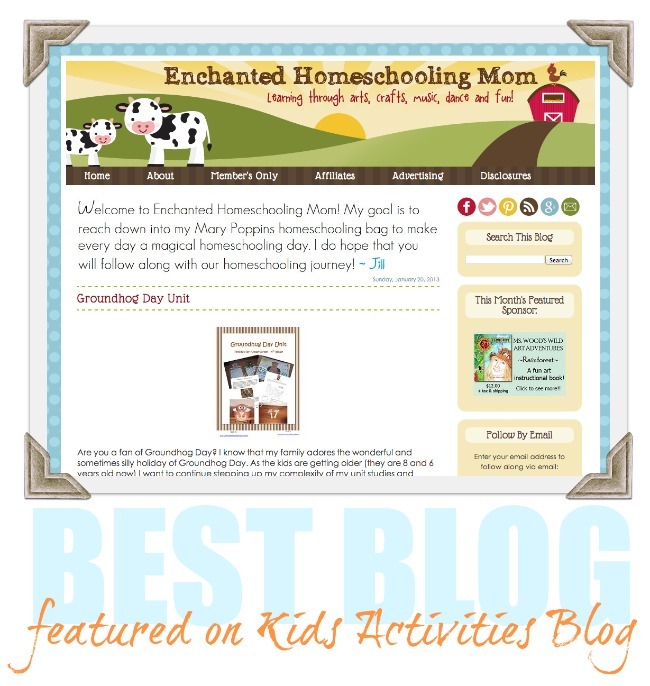 This week’s pick for our best blog feature is Enchanted Homeschooling Mom. We are featuring an interview with Jill today and rounding up some of our favorite Enchanted Homeschooling Mom posts tomorrow. Kids Activities Blog is so excited about our best blog series. We are hoping to introduce you to some sites you won’t want to miss! The Enchanted Homeschooling Mom is written by Jill, the mother of two kids. Jill shares printable creations, curriculum, lesson planning, lesson ideas, recipes, giveaways and much, much more at her blog. Why did you begin blogging? I must openly admit that for me personally blogging is both my hobby and my business at the moment. First and foremost my time and attention is spent taking care of my family and being a wife and mother. I was very reluctant to create, write and maintain a blog at first since I knew very little about the blogging world the interworking's of it. However, I strongly feel that our entire family benefits from my blogging hobby. 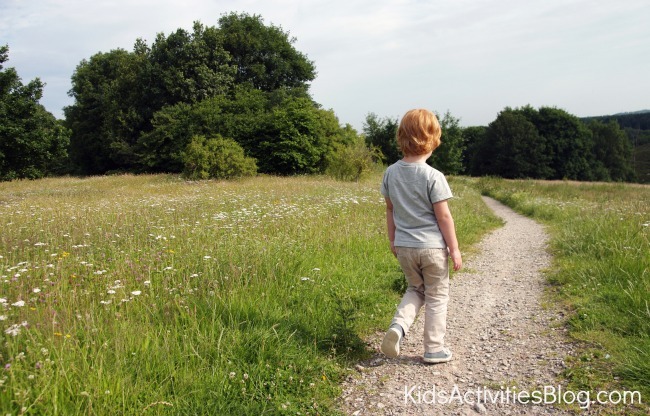 I am able to express myself creatively, bring ideas into our homeschool classroom or household and most importantly it allows me to know that our family is most certainly not alone on this homeschooling journey. Every family has such a wonderfully different way of homeschooling that I think we all inspire one another. If it weren't for the blogging world we would not be able to share these ideas, experiences and suggestions. My blog has become my safety net reminding me that I am not alone on this homeschooling adventure. What do you hope to inspire in the parents who read your blog? My goal is to reach down into my Mary Poppins homeschooling bag to make every day a magical homeschooling day. I hope to remove the feeling of dread and the stigma of homeschooling that people who do not know what it means to homeschool place on those of us who do homeschool. I would hope that parents reading my blog will know that there are resources, blogs, and people out there that are going through the same thing they are. What is it like to live in the Enchanted home? I have two lively children. Beck is 8 years old and full of silliness (Jim Carrey style) as well as a very over analytical mind. Elizabeth is 6 years old and we have called her since day one in the hospital our “Pistol Packing Princess”. She is a lovely girly girl who the moment you turn your back is giving the boys a what for or diving into a mud puddle in her princess dress. Elizabeth also has a speech impediment that has been a challenge not only in our homeschooling journey but also as a family. I also do not want to forget my 3 furry rescue dogs (who are also like my children) Gus Gus, Daisy and the Captain Jack Sparrow. What are your kids favorite activities? Anything centered Lego’s or exploring the outdoors on 16 acres of property. Lego’s allow the kids to use their imagination, creativity and knowledge learned in books to create Lego scenes. They love exploring outside because even though they walked to the same tree yesterday there is always something different along the path. What is important to YOU as a blogger? I try to be open and communicate with anyone who has questions about homeschooling or any other topic that I raise on my blog. I that with open lines of communications, assisting others, and being approachable that if I can help at least one other family out there then my blog will be a success! What is your advice to readers? Step back, breathe, and allow your child to spread their wings. You can also catch Jill on FB, Pinterest and follow her as @EnchtHomeschMom on Twitter. Thanks Jill! We loved spending time with you today. I had a lot of fun doing this interview! Thank you for featuring Enchanted Homeschooling Mom! I’m a huge fan of this site!